Are you passionate about writing blogs? Millions of people write blogs these days where they share their experience and information. However, there are individuals who would love to write blogs because they would love to improve the virtual traffic flow on their website or because they want to have online presence. If you are keen to write blogs that can help you to promote your business then you can write on the brand new Blogs Directory by DirWell.com where you get the opportunity to write high quality blogs that can make a difference. Most SEO professionals today believe that a better way to promote websites and to improve online traffic is through backlinks and one can certainly use blogs to generate more backlinks that can help the websites to grow over a period of time. 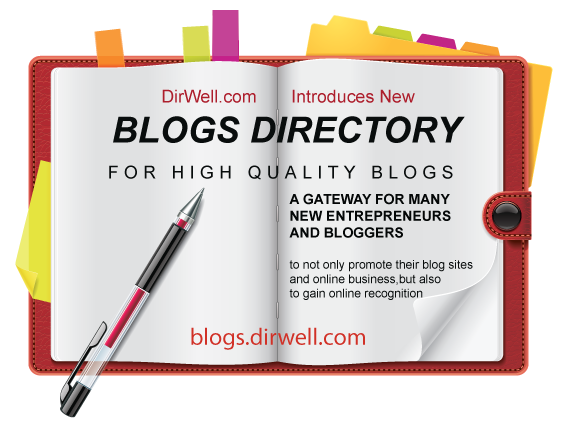 With the introduction of blogs directory by DirWell.com individual bloggers and even new online companies have the opportunity to get more online exposure as one can submit high quality blogs to promote online business and to share inside details about certain products and services that are available. The all new blogs directory started by DirWell.com will be a gateway for many new entrepreneurs and bloggers to not only promote their blog sites and online business, but also to gain online recognition as more and more online traffic will come up on the site to submit and read blogs related to popular products and services. Blogs directory is available freely to everyone and therefore there are no charges for submitting the blogs. However, the website will only approve high quality, spam free and family friendly blogs that have rich content value. The blogs directory also provides lots of options to various blog owners, blog marketers and individual bloggers as they can submit their blogs with wide variety of categories that are already available on the site. Bloggers are invited to submit their blogs on various niches ranging from arts and literature to sports and entertainment. The directory already has more than thousand categories but more categories will be added as and when demanded. Bloggers and blog owners are requested to send in their feedbacks and suggestions about new categories that they would like to have on blogs directory. People can send in their feed backs through Contact Us page. With the right kind of support and feedback from bloggers DirWell.com plans to build largest blogs directory that would not only provide great information but also help new online companies to get some online exposure.